Anchors Landing is a gated community located on Lake Hickory, in Granite Falls, North Carolina. The community consists of approximately 300 properties with a clubhouse, swimming pool, inland lakes and walking trails among the amenities. Gatehouse: Electronic security gate with keypad entrance or personal, portable remote-control clickers. Golf Nearby: Over 20 private and public golf courses, including Lake Hickory Country Club and Rock Barn Golf Club, are located close to Anchors Landing. Granada Farms Country Club is located 1/2 mile from the Anchors Landing front gate. Hickory Lake: 105 miles of shoreline, 4200 acres water surface. 16 boat launches, six marinas, and a boat-accessible restaurant. Clean, fish-friendly water of a crystal blue color stays at a constant level, unlike other NC lakes. Lake Hickory's attractive shoreline and pristine, sandy bottom are regionally-unique. Boating traffic is relatively light. Schools: Students attend schools in the Caldwell County Public School System at Granite Falls Elementary, Granite Falls Middle School, and South Caldwell High School. Four community colleges are within a 20-minute drive. Utilities: Underground power, phone lines, county water and individual septic tanks. DSL internet connection is also available. Lots: Lot sizes range between 1 and 4 acres and current prices range from $25,000's to the $160,000's depending on views, landscape features, and proximity to the various lakes. Homes: No specific homebuilder or architectural style. Anchors Landing Architectural Review Committee approves permanent home plans before construction with minimum homes sizes depending on lot. Construction prices vary depending on owner's plans and level of detail, but are expected to range between $300,000 and $900,000. 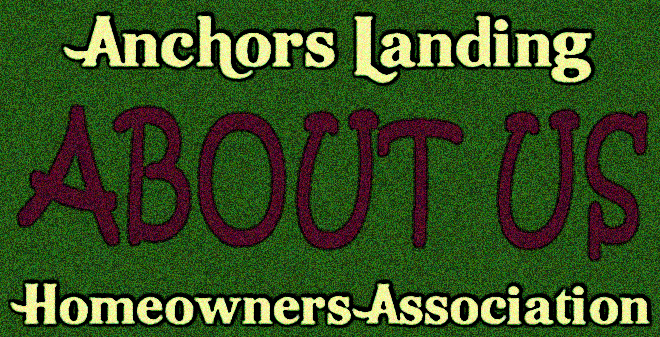 The Anchors Landing Homeowner's Association is an organization comprised of all owners of properties in the Anchors Landing Community. We are governed by a board of directors and are bound by restrictive covenants. Most of the site is restricted to property owners only. Please click the "register" link and provide your name, telephone number and Email address. Please provide your Anchors Landing lot # in the street address section of the registration. Our goal is to provide a strong voice for the neighborhood and to be a primary source for important information, as well as community building communications. If you have tried to register for the website and have not received a confirmation Email from: hoa@anchorslandinghoa.org please check your spam folder. The website registration is generated from this Email address and if it is blocked by your spam filter you will not receive notification. All registration Emails are sent within 24 hours so if it has been longer than one day please contact the website administration and ask for help. You can also get a new password by logging into the site using your Email address as your user name and clicking "forgot password". The system will automatically generate a new password and send it to the Email address that you registered at the site.